Most of the books published previously in the field of water resource eco- nomics focus on particular aspects of water economics such as institutions, pricing or water markets, but none of them have given particular attention to methodological questions. However, the applied methodology within economic research has made some remarkable advances over the last 10-20 years. Some of these advances are of particular interest to the field of water economics. 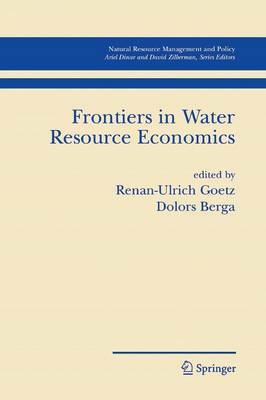 Therefore, we think that a book that focusing on methodological advances within the field of water resource economics and showing how these advances can be applied in economic analysis of water issues makes a nice complement to the existing literature in this field. We identified five areas where we consider the methodological advances to be of particular importance: 1) asymmetric information and game theory, 2) un- certainty, 3) space, 4) water quality and 5) production and technology adoption. The selected papers for the book fall entirely within these categories. The book ''Frontiers in Water Resource Economics" draws to a great extent on papers which were presented at the 7^^ Conference of the International Water and Re- source Economics Consortium, June 3-5,2001 held in Girona, Catalonia, Spain, This conference was jointly organized with the 4^^ Conference of Environmen- tal and Resource Economics by the Department of Economics, University of Girona.